Clean your detergent dispenser to remove laundry additive buildup. This should be done quarterly or any time you see buildup or loss of function. Consult your manual for your model specific details. Pull out the liquid detergent holder from the detergent compartment. Disassemble any cups, siphon caps or other parts that come off. Wash all of the parts under running water. Clean the dispenser recess with a soft brush. Reassemble the detergent holder parts. Push the Liquid Detergent holder back into place. 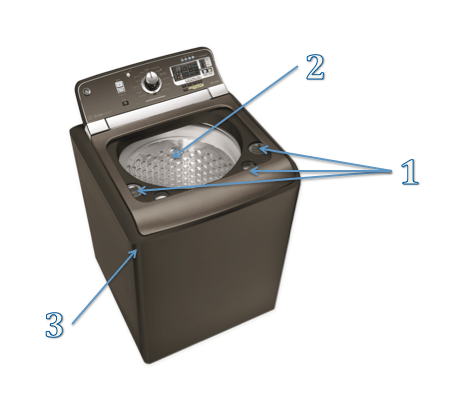 Run a Rinse+Spin cycle without any load in your washer, or proceed to run the cleaning cycle. A dedicated cleaning cycle designed for use with no additives or up to 1/10 of a commercial cleaning product (some Samsung machines). A dedicated cleaning cycle with 1/2 cup of bleach. The longest hottest cleaning cycle available on your machine with a cleaning product or bleach. Wipe down the exterior of your washing machine. Clean your washing machine thoroughly once a month. To prevent a sour and musty smell from developing in the washer, make sure to remove the load as soon as wash cycle is finished. If possible, leave the lid open for a while to allow air to circulate and prevent mildew in between loads. Every 4-6 months wash the filter screens. Unplug the washing machine. Shut off the water supply valves. Using a pair of pliers, disconnect the hose from the back of the washing machine. Place a pail or basin below where the hose connects to the back of the washer to catch any remaining water after shutting off the water supply valves. Remove both sets of screens and wash in warm, soapy water. You may need to use a soft toothbrush to scrub off any sediment or hard water mineral build-up. Replace the rubber hoses every 3-4 years. After years of use they can weaken and spring leaks. You can replace the rubber hose with a reinforced mesh hose. Turn the water supply valves off at the end of every wash day. Don’t forget to shut them off when going on vacation! !